Not long ago, I had a conversation with some other people regarding the opening ceremony of the Olympic games. Not being a fan, I didn’t watch it on TV but became quite concerned after seeing bits and pieces of it on the internet. I was able to see some of the still photos on the web along segments of home video. The symbolism was quite shocking, dark and sinister, but no relation at will with the games, or the athletes. Don’t you find that strange? A much trusted researcher, whose knowledge and insight I am thankful for, has taken the time to put it all together. You will see these ceremonies have nothing to do with “the games” at all. I find that quite odd and quite disturbing. And as a side note, and because I think there is a very strong connection, we should also consider the symbolism presented during the 2012 Superbowl halftime show. 25 For whoever desires to save his life will lose it, but whoever loses his life for My sake will find it. 26 For what profit is it to a man if he gains the whole world, and loses his own soul? Or what will a man give in exchange for his soul? 27 For the Son of Man will come in the glory of His Father with His angels, and then He will reward each according to his works. Lighthouse Trails has some important information regarding Rick Warren (Saddleback Church) and his newly formed weight loss program. (I think this story has gone viral!) Warren’s latest plan is another instance of those willing to follow a leader who has inadequate bible knowledge, yet esteemed as “America’s Pastor”. It says a lot for the church today; lazy and laid back, entertained, fat and happy. We want to know God but we don’t want to study the bible for ourselves. We want someone else to do the work and feed it to us. And when that teacher is found to be wrong what price are we willing to pay to keep him on top? Jesus did not take the easy way out although He certainly could have. He went to the cross to bear our sins– and in the scripture above “MY SAKE” means for Him. What are we willing to give up to speak the truth so that others may be saved from destructive teachings as these? In the video below, Dr. Oz, the new weight-loss mentor for thousands of Christians through Rick Warren’s new Daniel Plan, talks to New Ager Deepak Chopra about meditating to lose weight. What they don’t tell you in this video is that eastern-style meditation can put participants into contact with demonic spirits. The Bible warns against such harmful practices. Yet, Dr. Oz, also a Reiki advocate, is taking his spiritual “insights” to Rick Warren’s followers. Dr. Oz (made famous by Oprah) is Swedenborgian. This from their beliefs page. The requirements for salvation are simple: live well, believe rightly, and you will be saved. We believe that all people who live good lives, no matter what their religion, have a place in heaven. Heaven is limitless in its capacity for angels, in fact, the more angels there are, the more heaven thrives. Everyone born on this earth has been predestined for heaven. The only reason someone would go to hell is because they have chosen to go there of their own volition. In determining whether or not we have lived well, God leads us to assess the whole of our lives — the highs and lows, causes and effects, the mistakes made and genuinely good things done. If there is any possible way He can lead us into heaven, He will. In other words, it’s pretty difficult to go to hell. God’s greatest wish for us is that we find our highest happiness within the angel body. Those who choose hell are people who put themselves above all else, repeatedly indulging in things which are hurtful to others. The only reason hell exists is to preserve the freedom of choice which God grants to all His people. We play an active role in our salvation every day of our lives. When we look to the Divine and live according to what we believe is right, we move closer towards heaven. If we shun good, we move closer to hell. Thus, salvation and freedom of choice are inseparable from each other. Salvation is not dependent on the doctrinal specifics of the religion you have followed on earth. As long as you have lived a life acknowledging God and refraining from evil because it is against Him, you will be saved. Acknowledging God does not necessarily mean recognizing Him by name. A person can be ignorant of religion and still acknowledge God by living a life of goodwill. This is because the choices that we make on a daily basis are what determine whether we end up in heaven or hell. Yes, worshipping God is essential for admittance into heaven, but we worship Him through the actions of our lives. The New Church bases its doctrine on the Bible as illuminated by the writings of Emanuel Swedenborg, an eighteenth century theologian and scientist (read the full biography). This theology is founded on the belief that God used Swedenborg as a vessel through which to spread His teachings to people on earth. 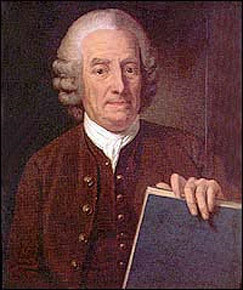 During a process of divinely inspired revelations, Swedenborg wrote thirty-five volumes of theological books, referred to as the Writings or Heavenly Doctrines, addressing the mysteries of human life which had previously gone unexplained or been misunderstood.One of the prime purposes for his work was to reveal an inner meaning in the Bible, thus uncovering new relevance and hope for mankind. Within the Writings, Swedenborg describes the nature of the Divine, the function of creation, and the life which awaits us after death. He also provides practical guidelines for having a relationship with God and bringing religion into everyday life. The mission of the New Church is to carry out this purpose in the modern-day world. Swedenborgian theology DOES NOT and CANNOT connect mankind to God. Jesus Christ did that for us when He went to the cross! John 3:16! It is only through our faith in him that we can be saved and hope to have a relationship with God! How much like the false teachers and prophets of charismania, the NAR and Dominionism with their bizarre visitations, out-of-body experiences, dreams and visions of “God told me” directives and the new thing God is doing! Yet Hebrews 1:1-2 tells us that there is no new revelation! 3 who being the brightness of His glory and the express image of His person, and upholding all things by the word of His power, when He had by Himself purged our sins, sat down at the right hand of the Majesty on high, 4 having become so much better than the angels, as He has by inheritance obtained a more excellent name than they. It only stands to reason there is a great possibility that many from Saddleback will be caught up in this “New Church”/Swedenborgian Theology, and/or the practices of eastern religious meditation. And it makes me wonder again what Rick Warren is really up to, and who this “jesus” is that he serves. Because it is not the Jesus written about in the bible. And the reason why we can say this with confidence is because Warren’s teachings do not line up with the word, nor does he heed it’s warnings. Rick Warren pledges to lose 90 pounds during a 52-week church fitness plan, developed by Dr. Oz and two other medical experts, that will launch on Saturday at Saddleback Church. The Daniel Plan, based on the prophet Daniel who chose healthy eating instead of the king’s rich foods, is a yearlong, churchwide program to help the Saddleback parishoners get physically healthier. Does anyone know what scripture Warren is referring to that states God wants us to be as healthy physically as we are spiritually? Does God ever refer to “spiritual health”? And for that matter, the prophet Daniel was not fasting or refusing rich foods for weight loss or health reasons! Warren is twisting the words of the bible to say what he wants them to. But why? 7 But reject profane and old wives’ fables, and exercise yourself toward godliness. 8 For bodily exercise profits a little, but godliness is profitable for all things, having promise of the life that now is and of that which is to come. 9 This is a faithful saying and worthy of all acceptance. noting that Warren has his own version of 12 stepping in his famous Celebrate Recovery Program. MWLF has more articles on this topic. Again, I am only nailing some pieces together. And how many of us were in awe of those Helen Keller stories??? A little detail was left out. Her religion spelled out here. 6 As you therefore have received Christ Jesus the Lord, so walk in Him, 7 rooted and built up in Him and established in the faith, as you have been taught, abounding in it with thanksgiving.